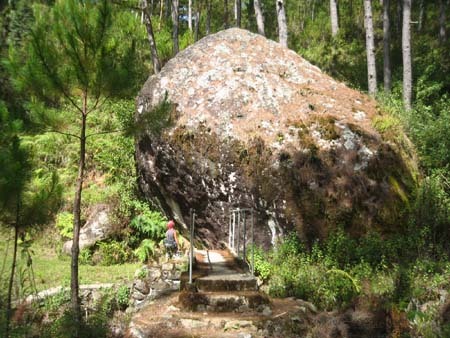 I heard from several sources that from a barangay south of Sagada, there lies a flight of stone steps that extend all the way up the mountain until it disappears into the clouds. Someone called it Stairway to Heaven. 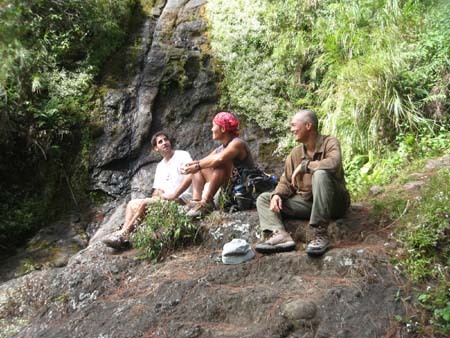 Immediately, I conjured romantic delusions of climbing it like Jack and the Beanstalk, and exploring the summit to discover waterfalls, wildlife and mossy forests. 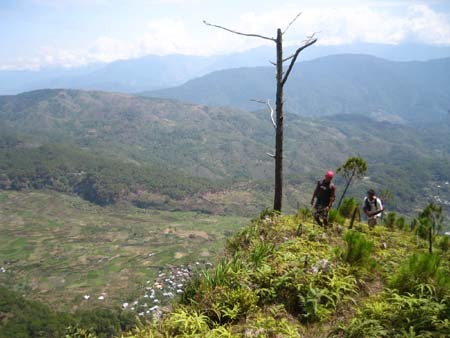 After broaching the idea with Steve, I was advised to find a route, from the summit to Mt. 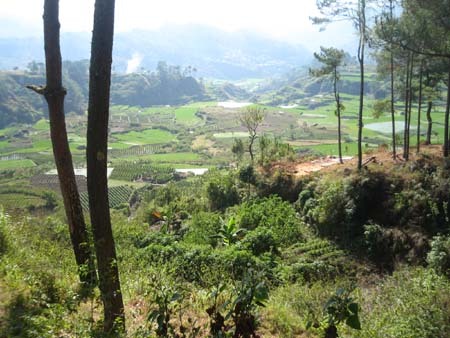 Ampacao, site of the Smart phone tower. 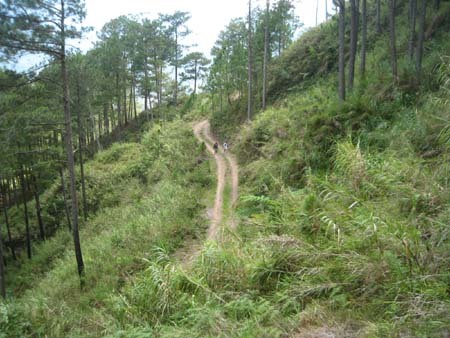 If mtb-rideable, that route will extend the single-track trail system we normally do from Sagada Poblacion to Mt. 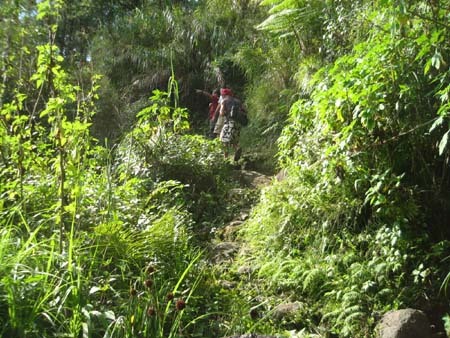 Ampacao, and now to Balintugan, the barangay where the stair leads to. I remember Aklay telling me once that the longest piece of single-track trail can be found on that ridge...getting to the ridge was the problem. It meant extended portaging of the bike on steep and technical trails from both ends. At that point, I was also reading up on orienteering from 'the bible' of mountaineering, Freedom of the Hills. After the UK downhiller, Simon, left me his topographic map of Sagada, I couldn't be satiated about using compass and map to navigate and look for suitable routes. Now was my chance. The possibilities were all there - once on top, I could triangulate my bearing from Mt. Polis and Mt. Ampacao, to find out exactly where I was on the map. I could also reference familiar landmarks and how they all figure in the map. Cool! As an added bonus, I just got my machete of choice - light, long, balanced, with a lateral play on the blade. It was the last remaining machete from this army surplus store in Manila. Blazing my way through thick jungle filled my wild imaginings (although in reality, I knew I'd probably be following a trail). I spent a good deal of time sharpening the machete. Advice from Steve (use a 30 degree tilt) and Andrew (back and forth motion on the sharpening stone like cutting sausage) helped in getting the blade blaze-worthy. I felt like Don Quixote, ready to do battle....against a windmill! 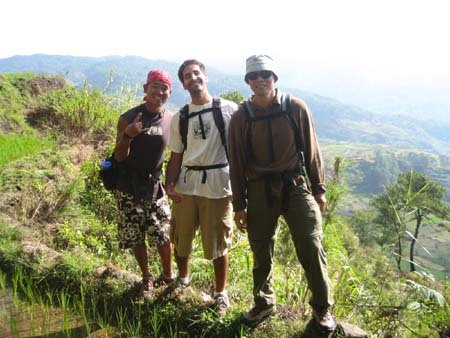 With 2 American tourists, Josh and Andrew, looking for some Sagada action as well, and Canadian runner Glenn, we headed out in search for the stairs. We got the trailhead right, but missed the start of the steps. Eventually, we stumbled onto it. They were not as conspicuous as I thought. I imagined a straight flight of concrete steps that was visible from end to end from the road. 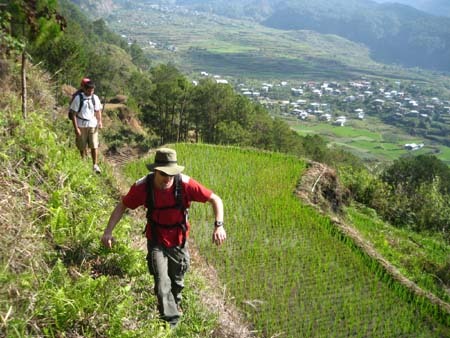 Instead, it was more like a steep trail reinforced by stone steps, meandering horizontally and upward, along the contour of the slope. The stone steps were there to hold back erosion and provide traction. The weather was perfect...too perfect - clear blue skies. Forget about the stairs disappearing into the clouds - there were no clouds. 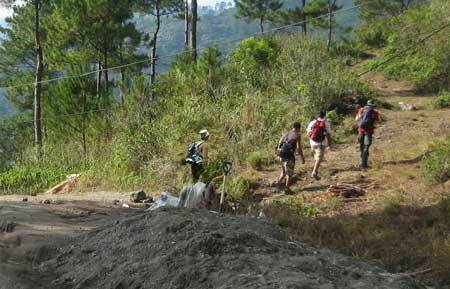 Upon reaching the top, we explored a bit but didn't go far enough to reach the village of Balintugan. We saw the ridge and started heading back on the ridge line in search of a route to Mt. Ampacao - that's when it started getting fun. The best hike is usually along a ridge. The view is magnificent on both directions and you almost feel like owning the mountain (or more accurately, a fly feeling as powerful as the cow it's on top of). We completely abandoned the direction Aklay gave us. We just followed any trail that took us to the ridge. Fortunately, there was always a trail. 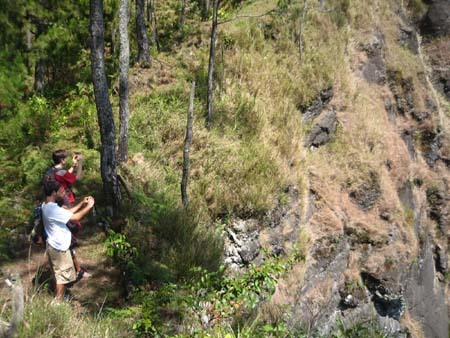 At one point, we were threading on the edge of the cliff, perhaps just a foot away from a vertical plunge. With not much to hold on to, I was scared shitless. I practically hugged the slope as I inched my way to safer terrain. Had I been alone, I would have turned back and taken a safer (but less scenic) route. But with 3 guys in front of me, all of them doing ok, I followed in compliance. 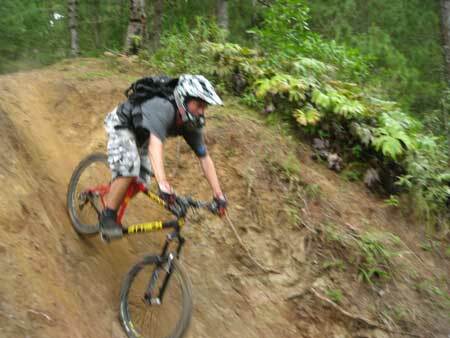 Once on safer ground, Andrew admitted he also got the jitters on that section. 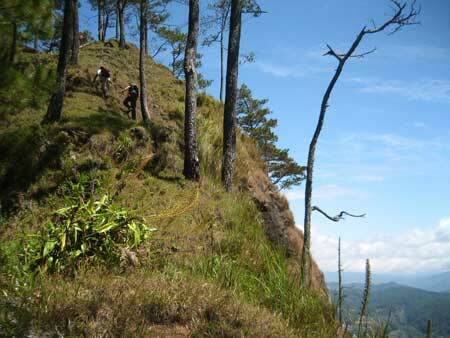 This is the 3rd time I've felt that fear while mountaineering. The first one on Mt. 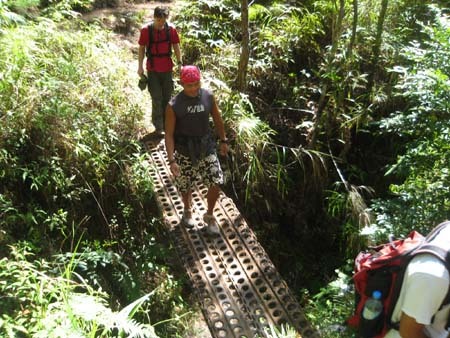 Pulag, and the 2nd one was with Aklay, doing a similar thing from a 20-ft waterfall drop. We kept faith in following the ridge until the Smart Tower loomed in front of us. The whole time, I was plotting out our bearing on the map, using a compass and bearings from trusted land sites (Mt. 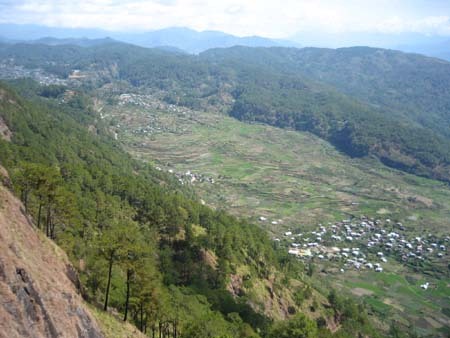 Polis and Sagada Poblacion). I have to admit, getting my bearing from a compass and plotting those bearings on a map to pin-point my location was empowering. I almost wanted to get lost in order to put it to a more stringent test. 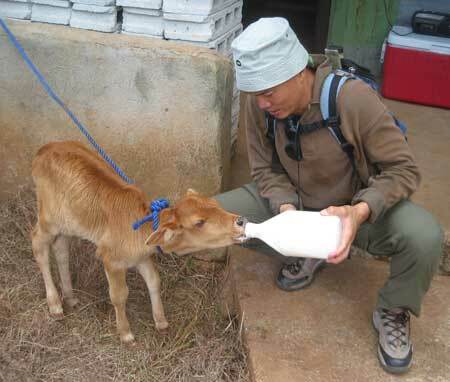 On the way back to Poblacion, we stopped by the farm of a German resident. 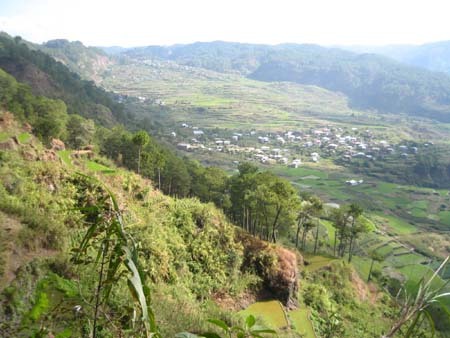 He made a ambitious project of scaling the mountain slope to convert it into a farm of sorts - growing produce, raising wild pigs, a calf and soon, deer. 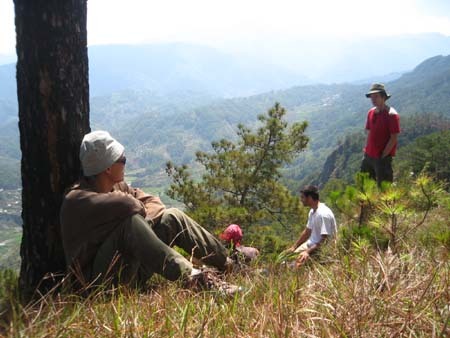 I've done many hikes in Sagada, but this is perhaps the most memorable for a few reasons. View-wise, it's one I had to earn. The fear factor certainly added to the rush and appreciation of the spectacular view that lay before us. Additionally, we weren't following a beaten path. 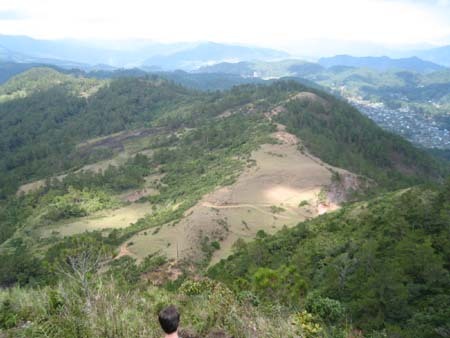 We were ridge-focused, and that essentially dictated what trail we followed. 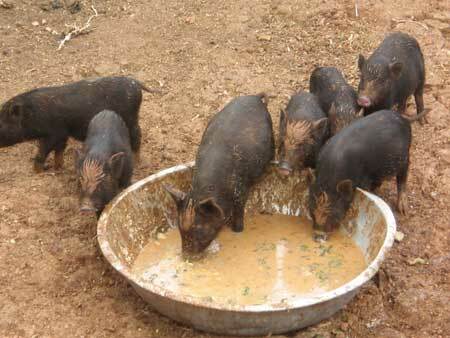 The company was collected, solid and gung-ho. They inspired confidence. 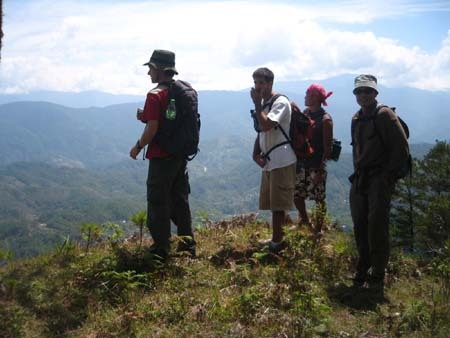 Lastly, we were exploring new routes, guided only by the ridge and familiar landmarks. Going 8 months into my stay in Sagada, and I still continue to discover new and fascinating secrets it doles out to a privileged few. I'm grateful to be a part of that.